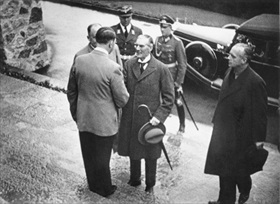 The storm clouds of war in Europe seemed to have parted on this date in 1938 in London, one day after British Prime Min­is­ter Neville Cham­ber­lain had returned from his triumph in Munich. Three visits to Germany had been required to part the clouds: the first to Berchtes­gaden in the German Alps on Septem­ber 15, 1938, the next to Bad Godes­berg near Bonn on September 22, and the last to Munich on Sep­tem­ber 29–30. It was the last visit that pro­duced the docu­ment (drafted by Her­mann Goering) agreed to by the Euro­pean Big Four: German dicta­tor Adolf Hitler, Ital­ian strong­man Benito Mus­so­lini, Cham­ber­lain, and Cham­ber­lain’s democratic partner, Premier Édouard Daladier of France. Following on the annexation (Anschluss) of Austria (now chris­tened Ost­mark) into the Third Reich in March 1938, the Munich Agree­ment of Septem­ber 29, 1938, legit­i­mized Hitler’s land grab of the Sude­ten­land, the Ger­man-speaking, western­most part of Czecho­slo­va­kia that had once been a part of the Austro-Hun­ga­rian Empire before it dis­solved into new multi­ethnic states in the after­math of World War I. To Czecho­slo­vakia the Sude­ten­land was of immense econo­mic and stra­tegic impor­tance, being both home to much of the country’s heavy industry and the location of its front­line defenses. Edvard Beneš, Czecho­slo­vakia’s presi­dent, was not a party to the any of the Big Four dis­cus­sions but caved in under heavy Anglo-French pres­sure, pro­mising to abide by the four-power agree­ment. Days later Czech Sudeten­land was in­cor­po­rated into the Reich—this on Octo­ber 10, 1938—and its grate­ful ethnic German popu­la­tion became one of the most pro-Nazi regions of the Third Reich. 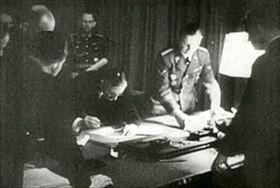 Hitler callously signed a second document in Munich, pledging no fur­ther terri­torial ambi­tions. “In spite of the hard­ness and ruth­less­ness I thought I saw on his face,” Cham­ber­lain said of his meetings with Hitler, “I got the im­pres­sion that here was a man who could be relied upon when he had given his word.” It was Hitler’s written pledge of no other terri­torial inter­ests in Czecho­slo­va­kia that the smug and naïve prime minister (in office from May 1937 to May 1940) famously waved to crowds at the West London air­port, declaring that he had secured “peace with honor,” which he believed was “peace for our time.” These words turned out to be Cham­ber­lain’s poli­tical epi­taph. They remain the most indel­ible sym­bol of irony and the futil­ity of appea­sing dic­tators and bullies that exist in the his­tory of World War II. But for the moment both Britain and France expressed relief that Hitler’s saber-rattling had not led to war. Left: The German-speaking regions of Czechoslo­vakia (high­lighted in bur­gundy with­in an out­line map of the cur­rent Czech Republic) were popu­larly referred to in the inter­war years as Sude­ten­land. The Czech part of Czecho­slo­va­kia (Czech home­land) was sub­se­quently invaded by Nazi Germany in March 1939, with a por­tion being annexed by Germany and Poland (Teschen, the German name for the Polish Cieszyn and the Czech Český Těšín). 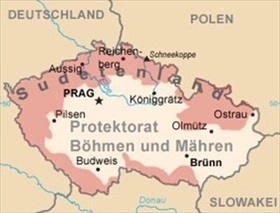 What remained was turned into the Pro­tec­torate of Bohemia and Moravia (Protek­torat Boeh­men und Maeh­ren) shown in light pink on this map. The Slovak part declared its inde­pen­dence from Czecho­slo­va­kia, becoming the Slovak Republic (Slowakei on the map), a satel­lite state and ally of Nazi Germany during World War II though forced to lose a portion of its territory (Ruthenia) to Hungary. Right: On September 15, 1938, Chamberlain mounted the steps of Hitler’s Alpine retreat, the Berg­hof near Berchtes­gaden, wearing his trade­mark stiff wing collar and carrying a bowler hat and bumber­shoot (umbrella). The two leaders agreed to German demands that Czech Sude­ten­land be granted self-deter­mi­na­tion. Three days later French Premier Édouard Dala­dier agreed to the same. 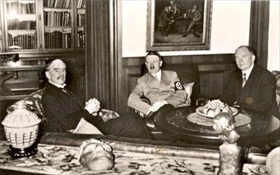 A week later Cham­ber­lain met Hitler in Bad Godes­berg to con­firm the pre­vious oral agree­ments in exchange for (as it turned out) a few more months of peace. Hitler, having suc­ceeded in out­witting the two slow-thinking states­men, now demanded not only the annex­a­tion of the Sude­ten­land but the imme­di­ate mili­tary occu­pa­tion of the region, giving the Czecho­slo­vak Army no time to adapt their defense measures to the new borders. Czech mili­tary effec­tive­ness was thus fatally weakened when this was accepted. 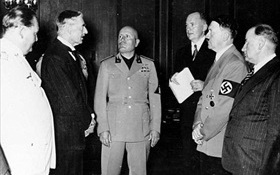 Left: Hitler (second from right in photo) and Hermann Goering (on left), who authored the proposal Benito Musso­lini (center) pitched to Cham­ber­lain and Dala­dier (extreme right) for a Euro­pean sum­mit to end the Czecho­slo­va­kian “problem” (Cham­ber­lain’s words), listen to the British prime minister speak through the chief German Foreign Office interpreter, Paul-Otto Schmidt (holding folder). 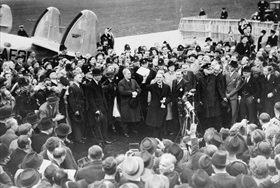 Left: Aided by the light of a table lamp, Cham­ber­lain affixes his signa­ture to the Munich Agree­ment at about 1:30 a.m. on Septem­ber 30, 1938. Standing oppo­site Cham­ber­lain on the other side of the desk is German Foreign Minister Joachim von Ribbentrop.